2 The French Revolution, like the American Revolution, was a revolt by people who wanted to rule themselves. A few years into the Revolution, the revolutionaries did succeed in removing the king from power, but then a strange and unhappy turn of events occurred. 3 France did not become a democracy. It did not become a country where people enjoyed more rights than before. In fact, just the opposite happened. A violent dictator took control of France, and for two years from 1793 to 1794, many French people lived in fear of their lives. 4 It began in 1792 when a new National Convention was selected to become the legislative branch of the government. In 1793, a Constitution was adopted. So far, the Revolution was progressing well. Then, with the war still in full force, the National Convention decided to take over executive power as well. It appointed the Committee of Public Safety which became the executive branch of the government. 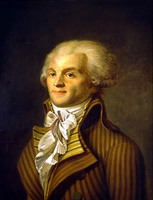 Members of the Committee, led by Maximilien Robespierre, took wartime control of the country. Robespierre ruled with the power of a dictator.